Jacob the Pope steps aside from the turntables this evening to have DJ Astro138 (Jesse) and DJ Zorch (Jorge) take over the music for the evening. We recently exhumed DJ Zorch’s debut in Episode 13, but he returns with another fatty stack o’ wax and a fellow record hound as well. They’ve got some wild 45’s ranging from Exotica to RnB, Instros to 60’s garage proto-punk. Both Jesse and Jorge are setting up a KILLER gig called The Moldie Oldies Party to be hosted at Mr T’s Bowl in SoCal’s Highland Park. 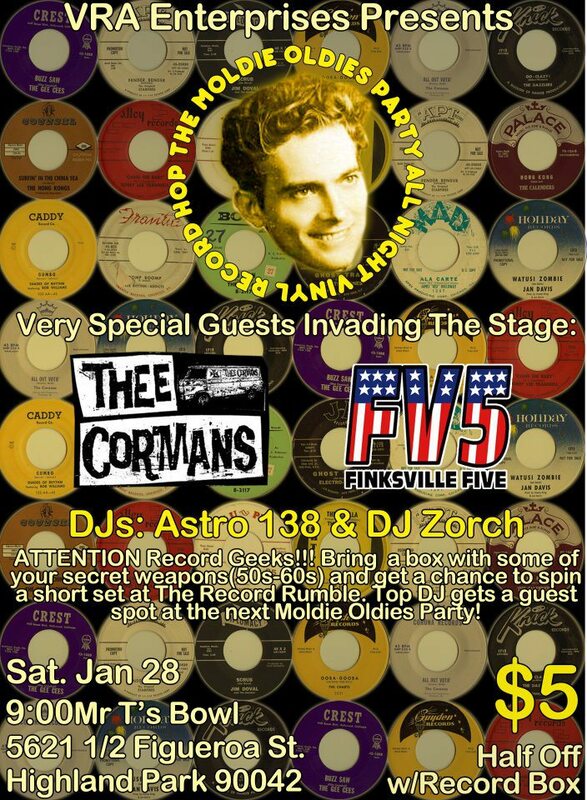 Not only are two record-nerds going to be spinning full sets, but they are accepting challengers from the public. Think you got some rekkids that can stand up to theirs? It’s only five bucks, but if you bring a box of records, then it’s less than the price of hot lunch, bus fare, or yer decaf-mocha-chino-acciatto. This episode I got to ask DJ Astro138 and DJ Zorch all about their records, the stories behind them, and their inspiration for the gig. If you’ve never heard of Mad Mike Metrovich then this episode is for you! Throughout the show, we mentioned a Vinyl Record Association on the facebook, and a sleazy RnB session back in Episode 58 with DJ Hobo Stab. I said I’d put up links for them on the blog post. So. There they are. Click them. Still hungry for more Zorch Radio? Check out the Archive Page, all handsome and Dewey Decimal’d up! Follow Zorch Radio on The Twitter and like us on The Face Book. More info is also on the contact page. This entry was posted on January 14, 2012 by Zorch Radio. It was filed under Audio .